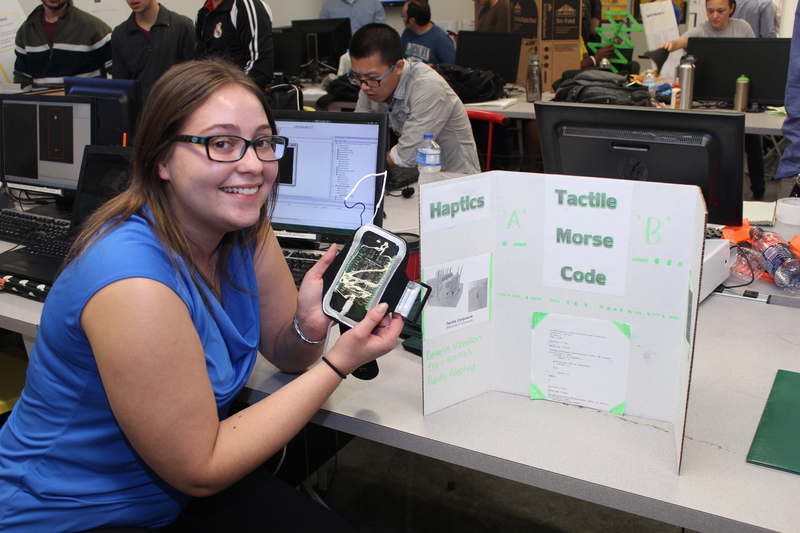 Students from Haptics and Kinematics/Dynamics demonstrated their projects, December 7, 2015. Haptic communication can be important for people who are blind and deaf. It is a nonverbal and nonvisual type of communication that has seen prominence since we are incorporating better uses of technology. This project focused on a wearable haptic device that utilizes Morse code to provide haptic feedback to the user who can then receive communication. The device itself is a Phidget InterfaceKit. Attached to the ports of the kit is a small vibro-motor approximately 10mm in diameter. Utilizing C programming and Microsoft Visual Studio, the device can read a user input and then interpret it into a series of vibrations that are long and short, one to four "characters" in length, depending on which letter the user inputted. During a testing of the device with 12 subjects, data was collected to determine the feasibility of design, comfort, and an experiment was done to see if a user could pick the proper letter from a Morse code chart after wearing the device. Last modified on Dec 7, 2015.